Welcome to ER&L! Come pick up your badge on Sunday and say hello! Please register in advance of the conference as space in each of our sessions is limited. If you are a librarian or library staff member, we would like to invite you to participate in a focus group discussion that will explore some of the challenges that libraries have faced in recent years. Among these challenges are communication between librarians and institution faculty, how purchasing and collection development decisions are being made, ways that publishers may assist with these challenges and more. 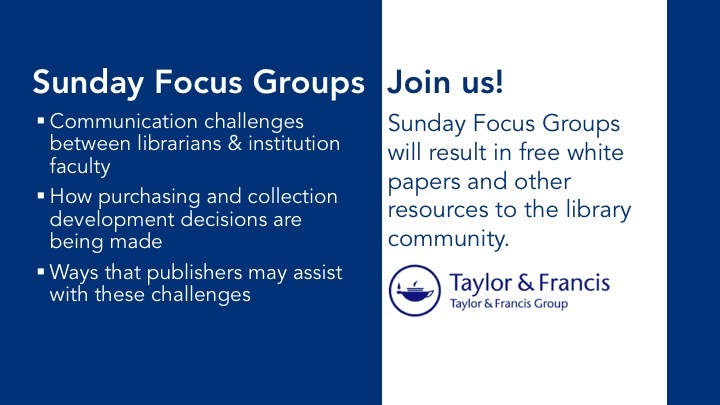 These focus groups, conducted by Taylor & Francis, will be an opportunity for you to share your thoughts and experiences; your views are extremely valuable in helping us to shape our research around these important topics. This research will be used to produce white papers and other free resources that will aim to expand the conversation and benefit librarians, institutions and publishers alike. At each session we will be offering complimentary tea, coffee and assorted snacks. At each of the three sessions we will be entering participants into a raffle drawing. Three lucky winners will receive a $100 Amazon Gift Card. Please register in advance of the conference as space in each of our sessions is limited. RSVP using the link above. THIS WORKSHOP IS SOLD OUT! If you are intersted in this course, check Eventbrite to sign up for a seat in a repeat of this course on Wednesday EZproxy: Assessment and Administration Techniques and Tips. The EZproxy remote access management software is one of the most commonly used tools by libraries managing remote access to licensed online resources. This workshop is for anyone involved with administering EZproxy as well as those interested in the usage information gathered in its log files. Technology, education, libraries, photography, ice cream, barbecue, sports, music, movies, travel, anything and everything. You need this ticket from Eventbrite to sign up: Pre-Conf Workshop 2: Understanding Copyright and Making It Work for Your Library. Learn about copyright basics, the latest developments in copyright and its impact on library collections, and how copyright can help promote and expand library services. For those familiar with copyright, this workshop will serve as a copyright refresher course. This session will also be useful for those who do not engage with copyright issues on a daily basis, and would like to know more. You need this ticket from Eventbrite to sign up: Pre-Conf Workshop 1: Understanding and Using Altmetrics for Collection Management: An Interactive Overview. Libraries rely on multiples types, sources, and interpretations of data to inform collection management decisions, with an emphasis on anticipating and assessing local needs, cost, and use. With the transition to digitally born and Web-based scholarly communication, altmetrics (“big data” about how scholarship is used on the Web) can tell valuable information about trending sources and scholarly topics, the tools researchers and faculty are using to promote and discuss their scholarship, and the impact of the scholarly communication platforms, such as institutional repositories, that libraries provide. In this hands-on workshop we’ll explore how to integrate this data into e-resource collection management activities, and the evaluation and promotion of library initiatives. Overview of various altmetrics providers and how their tools can be used to discover discussions of research in mainstream media mentions, policy documents, blogs, and social media. How to get a rich picture of “trending” research in all disciplines, which you can use to supplement your collection management decisions. How to uncover the platforms and tools students, faculty, and the public are using to interact with research information. How to gather, analyze, and communicate altmetric data about and within institutional repositories. REGISTER HERE! A ticket is needed for this event! Don’t Forget to add a Pre-Conference Workshop when you register for ER&L! University of Texas Libraries is offering guided tours of the Learning Commons, STEM Learning Spaces, and Scholars Commons pilot in PCL to attendees of ER&L, CNI Spring 2016 Membership Meeting, and Designing for Digital. Tours are offered at 4pm and 5pm on Sunday, April 3 and last ~45 minutes. This reception will be hosted by University of Texas Austin Libraries. *This session will be available only to Online Conference attendees and within the Archive. Hear how SAGE Publishing developed and continues to evolve its SAGE Research Methods suite to match how research methods and research skills are taught in course curriculum and applied by new and seasoned researchers alike. Based on extensive market research and customer feedback, new content types and platform enhancements have launched to meet the needs of faculty and librarians who are training the next generation of researchers. Join us for morning yoga led by Kelsey Nunez from Eastside Yoga! Room 301 has lots of sunlight and a beautiful view of the capital building - what a great way to start your morning! A small number of yoga mats and towels will be in the room for those totally new to yoga. We kindly ask local attendees/regular yoga students, please bring your personal yoga mat to the class. New to yoga? No need for expensive yoga gear, comfy clothes that you can stretch in. No shoes are worn during yoga. Try not to eat for two hours leading up to your class. Feel free to bring water bottles. Prevailing views about time and productivity rely primarily upon observations and practices developed in industrial settings. In this keynote, Professor Dawna Ballard will lend insights drawn from two decades of her own research in the field of chronemics—the study of time as it is bound to human communication—about how post-industrial work requires a different set of literacies. Beth Ashmore (Samford University) and Jill Grogg (LYRASIS), authors of The Librarian’s Guide to Negotiation (Information Today, 2012) as well as presenters at a previous ER&L negotiation post-workshop with Rick Burke and James Wiser (SCELC), discuss the most interesting aspect of their ongoing negotiation research: gender and negotiation. Beth Ashmore is Associate Head, Acquisitions & Discovery (Serials) at North Carolina State University. Jill Grogg is a Licensing Program Strategist with LYRASIS. Previously, she was electronic resources librarian at The University of Alabama Libraries for over a decade. This update will share preliminary findings of the environmental scan. All data is imperfect. In this presentation, we shift the focus from data critique to data modeling, presenting a time-series of analysis of selected resources. Using decomposition and exponential smoothing to look at usage trends, we highlight simple modeling techniques which can be tested and then applied in collection management. Ever thought about co-subscribing e-resources with another institution? Two University of Minnesota campuses explored and developed a collaborative model to do just that! The key lessons learned can help you foster a synergetic environment. Discover how to build and strengthen relationships, achieve savings, and gain efficiencies. Previously worked at the University of Minnesota Duluth. Altmetrics measure the impact of scholarship via mentions in social media and other non-traditional venues. For librarians and faculty, altmetrics are also a new area for research. The focus of this presentation is the results of surveys of academic librarians’ and LIS scholars’ awareness and use of altmetrics. Join librarians and OCLC staff as we discuss a service to help libraries reconcile and connect their data with WorldCat entities. Offering opportunities for disambiguation and connections to other web resources, this service suggests new ways to use the strength of libraries' collective data to improve efficiency, linking and discovery. Libraries face many challenges with maintaining electronic resource holdings that are constantly changing. Learn how content providers, a knowledge base and libraries are working together to ensure accurate and updated knowledge base holdings via institution-specific automated feeds which save library staff a great deal of time and frustration. We understand the importance of continually evaluating electronic collections but how can this be done in a consistent way and with helpful outcomes? This presentation will cover how collections can be systematically assessed on both the macro and micro levels, particularly in the STEM fields. Stretched e-resource staffing is a reality for many libraries. Find out how four librarians turned limitations into opportunities for innovation. For one, being a single person department led to the development of a home-grown ERM. For the others, also distance education librarians, it led to new partnerships with public services. I enjoy talking about all things geek, and exploring new food and beer places. Oh, I also enjoy talking UX for e-resource access and best ways to wrangle metadata into something useful. From 2013 to 2015 the Metadata and Cataloging Dept. of UNR Libraries led a successful effort across four departments to build a searchable database for special collections finding aids. Find out how this collaborative project was conceived and managed to make thousands of collections newly searchable and discoverable by patrons. Steven is Assistant Dean of Libraries at the University of Nevada, Reno. He is the administrative manager for collections, acquisitions, cataloging and metadata, discovery services (technical services), digital initiatives, and library IT. The LSU Libraries e-textbook initiative provides students free access to required textbooks through our website. The Libraries identifies required textbooks that are available in the e-book collection, then adds them to a searchable web page. This session will describe our program and how you can implement one at your university. In this session, presenters will discuss cloud-based discovery, and look at its architectural fundamentals. Panelist will discuss multi-tenancy, and – at the same time - showcase examples of how discovery can be customized for each library. In addition, a closer look will be given to infrastructure requirements on the vendor-side to ensure continuous, and secure, service for library users. Vegetarian and Gluten-Free options will be available at the luncheon. If you have special dietary needs other than these, please CONTACT US. Library technology has traditionally centered on the integrated library system (ILS) or library services platform (LSP). The ILS/LSP provides libraries with a holistic solution to manage all aspects of the library’s operations. Yet, at times, an ‘all-inclusive’ approach to library management may not be required or even desired. Libraries may indeed have an interest in deconstructing the technology ecosphere by choosing those applications or modules that best serve their needs. Done right, a new model, centered on choice, and focused on ‘best of breed’ services and applications, can bring increased efficiencies and result in better services. Deconstruction may in fact be well underway. Worldwide libraries are stitching together a loosely associated ecosphere of applications. This tapestry – which includes ‘stand-alone’ discovery, self-check systems, and ‘core’ ILS modules – goes beyond library applications, extending into other areas such as business intelligence (BI), customer relationship management (CRM), and financials (ERP). Of course, choice has its challenges. How does the tapestry, after all, take shape? The library community, as such, plays a pivotal role in the facilitation of choice. Think increased engagement around interoperability standards, and more involvement in promoting – and developing – open source solutions that best align with a library’s mission. This presentation will showcase and discuss approaches to making choice real. Specific topics will include current trends of tying applications together and the concept of community as the cornerstone of a new, deconstructed paradigm in library technology. KB+ from JISC Collections provides information about e-journal subscriptions and licenses via a knowledgebase, under an open access license. This session will discuss the KB+ sharing efforts. It will also include how ProQuest is using KB+ data. EZProxy is not just for authentication anymore. Come and see how one small college library leveraged campus partnerships to turn EZProxy log files into an ongoing assessment that measures the correlation between library use and student success measures like GPA, retention rates, and performance on research assignments. Take your professional development to the next level, curb burnout, and satisfy professional curiosity with a lateral move to a wildly different organization. Join us for a session on growing your career "up" or "out" by transitioning to a new position in a much larger or smaller organization. Betsy Appleton is interested in electronic resource management, scholarly communication, licensing, and collection development. Serials holdings, database a-z, and working towards an ERM with some cataloging and acquisitions mixed in. For fun, I enjoy baking bread. We report findings from a comprehensive assessment of e-book user experience from transaction logs, e-book usage data, and user tests. Results of the assessment have significant implications for the design of e-book features to support users’ reading strategies and help libraries create a consistent e-book user experience. How do students and faculty determine when to watch a video versus when to read textual information? Drawing upon primary research conducted in 2015 and 2016, this presentation uncovers new relationships between what students and faculty are looking for to support their research and learning both inside and outside of the classroom. Lightning talks are a staple of ER&L’s program. Open to all and first-come, first-served on a limited number of slots. Sign up at registration starting Sunday. Lightning talks are a great way to share a new project idea with colleagues, get input from your peers or find a partner for a future project. Managing e-book and streaming media workflows is an ongoing challenge. Libraries must be flexible and adaptive to keep up with changing acquisitions models and discovery options. This presentation will look at some of the changes the University of Nevada, Reno, has made within technical services to manage these challenges. This presentation will demonstrate pedagogical techniques such as scaffolds to engage learners in critical thinking and research process in a collaborative learning environment.The presenters will discuss scenarios in which they prepare and coach 21st-century learners to skillfully discern the targeted information using Google and Library Integrated & Discovery Services. E- metrics, Critical Thinking Skills in Multiple Learning Style Learners | | Other Interests : Gardening, Sky Diving and Traveling. Panelists will debate the merits of interoperability and look at the factors that either enable or prohibit choice in today’s library technology ecosystem. And, they will examine the viability of a “best of breed” approach to selecting systems and the interests of libraries to choose those applications that best address back-end workflow and end-user success. S21 - Patron Privacy in the Digital Age: Support from Many Data Handlers Required! Libraries have a long history of supporting patron privacy. But privacy in a digital environment, especially one that is web or cloud-based, is evolving in ways that are outside direct control of libraries. This session will discuss the framework around privacy--consensus work involving libraries, publishers, and vendors--lauched by NISO in 2015. Standards. Standards. Standards. Wine. Standards. Standards. Standards. Librarian- Vendor relations and discussions can be complicated and troublesome or clear and collaborative or somewhere in between. Establishing positive communications and relationships between publishers, vendors, institutions and individual librarians is crucial to the effective provisioning of information resources. This session examines survey results investigating how libraries and vendors might manage communication expectations given the changing nature of scholarly communication. Electronic resources management increasingly widens its breadth and scholarly communication continually grows its depth. Libraries and vendors have complementary and sometimes competing goals which are worthy of discussion. Increasingly, apps can be integrated within discovery to augment the user experience and enhance the interaction between a library’s stakeholders and its resources. Panelists will showcase how apps are used in their respective discovery environments. And they will look at the increased library engagement that apps deliver. When considering researchers’ information-seeking needs, we often focus on search, such as optimizations for Google-type library search. But what about unplanned instances of discovery? Through a study of undergraduate students and faculty, this talk summarizes common researcher experiences with methods of serendipitous discovery within the scholarly community. In April of 2016 Alexander Street will launch Anthropological Fieldwork Notes Online and the Anthropology Commons. This cross-searchable, integrated to an Open Access and for-fee database creates an unprecedented publishing solution for primary sources and archival materials in the field of anthropology. This 200,000+ page collection is an ambitious effort to find, license and digitize the fieldwork notes, images and recordings that informed the writing of the seminal anthropologists of the 20th century: Malinowski, Benedict, Gluckman and more. Come to this session to learn about how we are innovating a new funding model for Open Access. Choosing a discovery service is a large decision – one that impacts most every librarian within an organization. It may change the way the library markets its resources, and the way students interact with the library. Learn what trialing entails, and how to make the best impact during this important decision period. IUPUI University Library recently implemented an Articles on Demand service that allows unmediated article purchases in place of low-use journal subscriptions. The service eliminates subscription costs while still giving faculty what they want at their point of need. This presentation will share the implementation process, challenges encountered and faculty feedback. Teaching non-technical library staff how to manage EZproxy configurations can be difficult. This presentation will discuss a free, open source tool that provides a web interface for library staff to edit resource configurations and easily export them into one or several EZproxy configuration files. *This short talk is part of session "S29 - Tools"
Erin Holmes is a Systems Librarian for a consortium in North Carolina. The Collection Development Office at University of Wyoming Libraries was tasked with designing a statistics dashboard that ties collection-building efforts to research at the university. The project lead will discuss the what, why, and how of building a dashboard that features quantitative and qualitative information about the Libraries’ collection. *This short talk is part of session "S30 - Collections & Use"
We are all familiar with cost per use and overlap analysis metrics when evaluating databases for renewal or cancellation. This presentation introduces an additional "Do We Care?" factor - determining unique titles in a database and whether they warrant renewal. It will include a review of the software used for analysis. * This short talk is part of session "S32 - Usability"
The Coates Library at Trinity University created a survey to gauge our E-Book use on-campus. 240 students and faculty responded to the online survey; the results were significant! As a response, we created an E-Books at Trinity Libguide dedicated to helping users with each of our E-Book platforms. *This short talk is part of session "S31 - eBooks, Licensing & Accessibility"
When people think of "big data," they consider text archives and user behavior and stop there. Every day more media is recorded than was recorded in the entire 20th century and it's only accelerating. Fundamentally, this data is just noise if it's not organized and understandable. As we consider sentiment, emotional content, and object recognition in video, a statement like “that’s a great idea” contains radically more complexity. * This short talk is part of session "S33 - Coding & Data"
Academic libraries have largely embraced the pursuit of e-book content as a priority because of user demand and shifting collection philosophies. E-book marketplace challenges include variability of acquisition models and uncertainties related to standards and publisher and vendor practices. A largely unexplored aspect concerns e-book collection development for international and area studies specifically non-English language content. If you were given the opportunity to build a new library, how would you do it? Liz Lorbeer, the chief designer of a new digital library built from the ground up in under eight months, will share her experience on building a sustainable, fluid collection without an ILS. Link resolvers are essential research tools. Unfortunately, they do not always integrate well with particular databases and discovery services. This session will discuss Northwestern University's decision to eschew the Alma resolver in favor of a DIY solution tailored to PubMed, resulting in improved usability and accuracy of full text linking. Batchloading MARC metadata for ebooks is a standard practice in most libraries. But with fast-changing collections and ever-increasing demands on e-resources staff, the challenge of maintaining metadata quality is constantly growing. This talk will help librarians devise practical, flexible, and sustainable quality management strategies tailored to their specific insitutional needs. Several years in to the e-book age, academic library users continue to choose both print and electronic formats. This case study examines use patterns for shared print and shared e-books from one publisher in 2014 within the OhioLINK consortium. These patterns may inform future collection decisions within the group. Writing on library web interfaces must be succinct and meaningful to users. Librarians at the European Southern Observatory and Space Telescope Science Institute will present ongoing projects to harvest and curate metadata about the astronomical data used in scholarly papers. Efforts to develop processes to make data citation part of the scholarly publication process will be discussed. Many licenses for electronic resources are silent on accessibility. Many of those with clauses, are relatively weak, in that they may do nothing more allow for a VPAT on request. At Tufts University's Tisch Library, we have a project to increase vendor understanding of accessibility at a more granular level. PaperStats is a tool that integrates journal pricing from publishers with COUNTER compliant usage statistics to produce consolidated usage and cost reports. Have you heard of PaperStats and are wondering what it can do for your library? Or are you looking for a better way to determine the cost-per-use of your e-resources? If so, stop by for a brief history of our library's experience with PaperStats so far and where we hope this resouce will take us in the future! Editing a website governed by an institution-wide content management system can be difficult, as attempts to gain user feedback on changes are overwhelmed by comments about design features outside of the library's control. Come learn how a free online tool helped one library focus on testing designs they could improve. For several years Cornell University Library has used Google Analytics (GA) to track website usage. We will discuss why we think GA is inappropriate for libraries, why Piwik is a better option, and share a Piwik case study -- use and patterns of behavior for our Databases website. A Systems Librarian and a System Admin got together to teach programming for the non-programmer in the library. Learn about the challenges we faced: how we prepared, what worked, what didn't, and what would we change? Walk away with the resources to plan your own. Web Systems Engineer at Analog Devices, Inc. in MA. Pianist. Colored jeans enthusiast. Lefty. Drives a MINI named Sebastian. 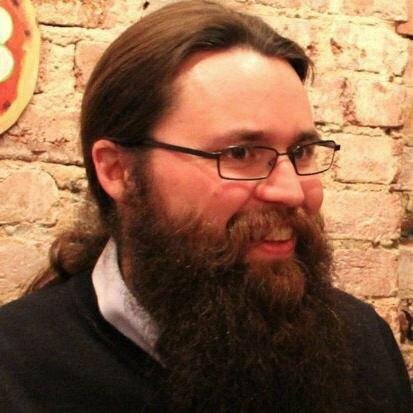 This presentation will provide an update on recent initiatives undertaken by the NISO Open Discovery Initiative Standing Committee, including ideas generated from the Fall Forum on Discovery held by NISO in late 2015, and solicit further input for what technical standards should be developed to improve interoperability in these important library interfaces. *This short talk is part of session "S36 - Standards & Best Practices"
Effective collection management and funding advocacy require that academic library materials budgets reflect the complexity of their underlying acquisitions. We introduce a faceted budget structure that addresses acquisition mode, material type, material format, and discipline in each fund-- thereby empowering budget transparency, reliable ongoing spending control, and accurate long-term planning. At Rollins College, the process of migrating to the Alma URMS and Primo discovery service involved (and involves) interrelated layers of communication among numerous stakeholders. We will examine the ongoing steps that should be taken to ensure efficient, clear, and expeditious communication and project management practices during and after migration. After major organizational changes in recent years, University of Kansas Libraries’ staff collected database usage data and statistics using LibAnalytics to discover a pattern of significant decreases in the use of our resources. To address this trend, library staff from three departments collaborated to find solutions to counteract these numbers. Amalia holds an MLS from Indiana University, as well as a BS and MS in political science from Illinois State University. She has worked at the University of Kansas Libraries since 2008. 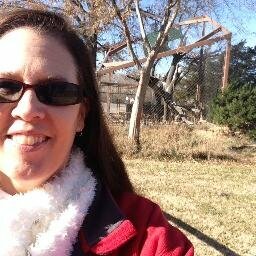 Julie Petr is an Associate Librarian at the University of Kansas. Her research interests focus on the delivery of library services to academic researchers, particularly the graduate student population. This study helps fill in the current picture of eBooks and pBooks in academic libraries by comparing the use of each on an unprecedented scale and by assessing the impact of the former on the latter using an innovative methodology that corrects for and controls problems facing previous studies. This presentation showcases how data visualization services can transform research support, from solely providing access to data, to actively engaging researchers with data. We will highlight Tableau, ESRI desktop and cloud-based applications. Examples will include energy research, consumer demographic analyses, and social media visualizations. Please join us for a quick update on the status of Transfer (now a NISO recommended practice). We will be discussing the current activities of the Transfer working group, new collaborations, and updates to the Transfer Alerting System. S36-03 - Standards for Altmetrics? What's Next? This talk will update its audience on work done at NISO to advance standards and recommended practices for altmetrics, including term definitions and use cases; identification of "alternative" research output forms (besides "an article"); and a code of conduct for data producers to demonstrate adherence to community definitions for data quality. There are a multitude of complex tasks for supporting electronic resources that require a well-trained and collaborative staff. These complexities are amplified during periods of continuous turnover and understaffing. This presentation will outline approaches to combating staffing challenges by exploring collaborations, re-evaluating workflows, and preserving institutional knowledge. *This short talk is part of session "S42 - Staffing"
The goal of this presentation is to provide different strategies to maximize the return on investment through promotion and marketing of library databases. It will also uncover the popular marketing theory & practices in use to develop an effective marketing plan for library databases using both free and paid methods. *This short talk is part of session "S44 - External Relationships"
Librarians who manage electronic resources will readily testify to the challenges; from managing holdings to setting up linking, there is much to account for. What are the best practices to consider when managing electronic resources? What tools exist and how do they work together? Where, how can, and should, vendors assist by enabling better workflows and interoperability? The study utilizes an innovative assessment method based on text analysis, faculty interviews, and student focus groups. The objective is to understand users’ e-book search behaviors and information needs across disciplines at Columbia University. The findings indicate that the e-book collection supports discontinuous reading, instruction, and ready reference. This session will provide three case studies of assessment and evaluation programs in libraries--one past, one current, and one future. The cases use three different modes of data gathering and analysis and show the power of understanding user needs and how well your organization is meeting them. This informative session will explore innovative solutions for increasing student engagement and faculty in-class use of digital primary sources. Join humanities and social sciences data providers Adam Matthew as they showcase new tools that will enliven students’ imaginations and faculty research. Hear from Michael Levine-Clark on how these features are transforming the learning experiences at the University of Denver. Attendees will have the opportunity to ask the panel questions and receive free, 30 day trial access to all interactive tools featured. Hello! When I'm not talking about digital resources or primary source research, feel free to chat to me about football (translation: soccer), food (any kind), the UK and anything you fancy really. Look forward to meeting you! S45 - Sharing and Reuse of Scientific and Research Data: Risky for Privacy? This talk will cover the development of community best practices regarding privacy considerations around research data. Management of scientific data sets created by researchers implies that these could potentially be reused, but tensions exist betwween the potential value of sharing data, and needs and expectations of privacy of the subjects supplying the data. S42-02 - Hit by A Bus: Could Your Library Survive without The Staff Who Manage Your ERM? E-resource management is chaotic; libraries are short staffed and under stress. Intota can help by removing siloed job duties. This session will demonstrate how to increase transparency and cross-train your staff with the “hit by bus” model: if you were hit by a bus, would your co-workers survive without you? Collection development and delivery of electronic resources to users have increased the importance of partnerships between libraries, vendors, publishers and other external players. This presentation will highlight some challenges in these relationships and how a delicate balance through mutual learning and shared understanding can bring maximum benefits to all parties. This presentation will highlight many challenges a new librarian or hiring library will face when transitioning to an electronic resources position. Whether you’re dealing with legacy systems or absent workflows, we will discuss techniques for meeting those challenges head on and turning them into opportunities for continued success. The McIntyre Library of the University of Wisconsin - Eau Claire benefits greatly from the philanthropic arm of a local company and this relationship has allowed the library to subscribe to resources it could not otherwise afford. This short talk will cover how librarians have endeavored to keep the donor happy. Inter-departmental cooperation between Interlibrary Loan and Acquisitions is an underutilized resource. The interlibrary loan department is uniquely positioned to provide invaluable e-resource support. This short talk will illustrate how the employees in interlibrary loan have become instrumental in helping identify access problems and increasing the discoverability of electronic resources. Slack is a free online software solution designed for teams to better manage internal communications. It is a hybrid of online chat and email (and more!) which can augment or disrupt the usual modes of communication. I will share how my team has used it to better share and communicate. St. Edward’s University and the University of Colorado Libraries assess the impact of DDA. St. Edward's discusses the impact of increasing short term loan costs, reduced availability, and limited staffing. The University of Colorado system evaluates DDA with a variety of assessment strategies. Good data visualization helps us discover hidden patterns and communicate complex concepts. This presentation describes an effort at ExxonMobil Upstream Research Company to create interactive visualizations of our technical reports’ usage and content. The end product generates insights into research and promotes engagement with readers and authors. Oklahoma State University has been undergoing a transformational reorganization, implementing several significant operational and organizational changes concentrated around electronic services and resources. OSU librarians representing Research and Learning Services, Outreach and Engagement, Digital and Technical Services, and Access Services will present on the ongoing changes and their impact. Join this session to learn about recent studies on the impact of library discovery solutions and their overall use by academic and research library patrons as well as the possibilities of leveraging technologies such as mobile experience and linked data to extend the reach of libraries to your patron community. An academic library took advantage of the availability of 3d scanning technology to pilot a project that would attempt to digitize 3-dimensional artwork and cultural artifacts, and exhibit them online. Learn about the issues involved. Marrying the breadth of your content with advanced discovery technology opens new ways for patrons to discover and explore resources, address their research needs, and enhance the value of your library. Join this session to learn about some upcoming Ex Libris content-based services for the Summon and Primo discovery solutions, and how to leverage them for the benefit of your users. COUNTER is inviting librarians to attend this lively lunch to inform the development of Release 5 of the COUNTER Code of Practice and priorities for the organisations. We look forward to hearing your suggestions and ideas! As Librarians, we want our collections to be used, but what happens when E-Resources are used “too much”? This presentation will describe how Thomas Jefferson University adjusted security procedures after excessive downloading was detected and access was suspended by a vendor. Discussion will include EZproxy security, log analysis, interdepartmental relationships. In small groups, participants will discuss and evaluate their Myers-Briggs personality type to see if personality types are drawn to specific roles in the library. To facilitate the exercise, participants will need to know their Myers-Briggs personality-type indicator. I have served as the Head of Acquisitions and Collection Development at the University of North Florida for seven years. I also have experience in public services and access services. I have a B.A. in English and an M.A. in Library, Media, and Information Science. Autistics have propensities towards attention to detail, analytical skills, creative thinking, and specialized knowledge. Management of electronic resources provides a perfect opportunity for autistic individuals to meaningfully participate in the workforce. An autistic librarian and his supervisor will share practical tips on creating a supportive workplace for neurodiverse people. LibGuides is used by libraries to curate knowledge and share information on any topic. In this session, panelists will provide practical examples of how discovery and LibGuides work together, and what implementation of a large database A-Z list looks like. Kim Copenhaver serves as Reference, Instruction and Access Services Librarian at Eckerd College and faculty liaison to the Behavioral Sciences. A group of librarians conducted a usability study to find out how users complete common research tasks using the library’s discovery system. The methodology, results, and impacts of the study will be presented. The presenter will play audio and screen recordings from the study to provide examples. Librarians have been redefining their role for the past 25 years. In today’s electronic world, librarians position themselves beyond traditional search experts: they focus their activities on data preservation and as experts for the institutional repository, as well as advisors on Open Access Policy for the university. Their expertise and understanding of complex metrics can now serve a new audience: research administration and research program strategy. In the session, we would like to review these analytical use cases through the InCites™ platform, as well as hopefully hear from librarians on their role in the use of research performance metrics for the university. With the prevalence of next-generation systems in institutions increasing, more and more libraries are benefitting from unified workflows and customization capabilities. Join this discussion on the benefits, challenges and opportunities librarians can expect to see when moving to next-gen e-resource management. As library budgets languish, e-resource availability flourishes, and new technologies emerge, two academic institutions share projects for reorganizing workflows. The presentation will cover reorganization efforts of Technical Services at Tulane University, and Acquisitions and Resource Sharing at University of Kansas. Both will outline processes, resulting strategies, personnel training, and assessment metrics. In early 2015, the University of Wisconsin System received a $250 million reduction in state aid. Facing both collection cuts and staff reductions, the campus libraries had to make some tough decisions. This panel will address how libraries at several smaller UW campuses managed these devastating and unforeseen cuts. We're an Alma/Primo library, in a large academic consortium (the University of Wisconsin). I wear many hats in my small library, so I know a little about everything! This presentation will focus on GOKb’s crowdsourcing approach as part of the project's long-term vision. The GOKb editor and volunteer data managers will discuss different types of work they have done with GOKb and how that work is helping to enhance the data quality in the knowledge base. Meet modern user expectations by making it easier to access and discover audio and video content. Making institutions locally created audio and video content available to the institution and beyond faces many challenges but can bring exponential value to the content. See how the University of Wyoming tackled the challenge. Ever wish you had the ear of a publisher BEFORE they migrated a platform? SAGE Publishing is making some moves, but we’d like to hear from you first! Come ready to share your opinions about best practices for platform migrations – What works for you and your patrons? What doesn’t? All participants will receive a $25 Amazon gift card. Spaces are limited so RSVP now here. No library has an unlimited budget. No one acquisition model fits all libraries. Some recent reports decry ebook acquisitions models like DDA and STL without incorporating correlations between budget trends, collection policies and buying habits or offering concrete solutions. In truth, navigating ebook collection development in the changing library landscape requires an understanding of the reasons why library budgets are shifting, how collections policies are changing (including the relationship between P&E), and the diverse acquisition models that are available. During this session we will dispel the current myths around DDA by sharing results from our recent Academic Library Book Purchasing Trends survey and offering best practices for building your larger acquisition strategy—one that includes Print and Electronic books and diverse acquisition models. In spite of facing a limited budget and very small staff I implemented a data-driven model for electronic resource management. By utilizing EBSCO’s Usage Loading Service and Usage Consolidation Tool I identified cheap, robust platforms to streamline workflow and maximize efficiency and productivity. Innovative means of access to and management of electronic resources, cool new technologies, and any interesting stuff you're up to. S65 - True Impact: How to Measure and Drive Deeper User Engagement? User Engagement is a matter of common parlance in today’s business world. Few managers or investors will assess the performance of a business on how many users or hits it has alone; equally, if not more, important is how “engaged” those users are. Metrics such as “active users” have replaced “unique visitors”, in order to provide a perspective not only of the volume of people benefiting from a resource, but also the scale of impact it is having on them. Steve Jobs once said, “I would rather a business with 100 impassioned users than 100,000 indifferent ones”. Libraries are catching onto this thinking too. Historically, libraries have had limited tools to monitor or interpret user engagement and this has underpinned the way in which resource development has developed. The traditional approach was the “volume strategy” where, in the absence of insight into our users and with a consequentially hindered pulse on demand, our objective was to provide as many resources as possible at the lowest cost. This has often been dubbed the “just in case” method, where key metrics were volume and cost (e.g. cost per item). Today, we find ourselves firmly in a time of “ROI Assessment” where, with improvements analytics tools, we can now introduce a perspective of “value” into resource assessment. This heighted focus not just on use, not just volume, has spurred new roles in resource assessment and new models such as “patron driven acquisition” where the idea is to provide a greater breadth of resource whilst more closely aligning our budgets to users’ requirements. This has often been dubbed the “just in time” method, where key metrics are cost per use/user, etc. But what of the future? The reality is that we currently have no perspective on the true impact of our resources. The “R” in our current “ROI” metrics will only tell us if someone accessed or used a resource – it does not tell us how they used it, why they used it, and what impact it had on them. We foresee a new era of “Impact Value Assessment” emerging that will, as in business, provide libraries with a more accurate way to gauge the true impact or “value” to our end users. (3) to develop tangible approaches for how we could incorporate this information into our acquisition, assessment and promotional activities. We believe that developing reliable engagement ROI metrics will further transform our approach to resources in the digital age, and bring libraries up to speed with industry best practices. MHC LITS has successfully used cost-usage data to guide the way when working with faculty to make e-journal subscription review decisions. For the 2015 review, we delivered Collection Development multi-faceted, multi-year actionable data using tools like ExLibris' UStat and additional reports like COUNTER JR5. High quality data is essential for discovery and access of e-resources, but in many cases low quality, inaccurate information leads to low usage and a poor return on library investment dollars. Librarians, publishers, and knowledge base providers will talk about how they are working together to improve access to e-resources. Come meet SCELC and TexShare at ER&L! SCELC is hosting a meet-up with Texas librarians so you can learn more about the growing SCELC-TexShare partnership, and the licensing opportunities afforded by the efforts of two consortia working together. This presentation will examine ways to present a library’s story to its stakeholders when e-resource data shows downward trends. It will explore potential resistance from telling such stories, and the ramifications in reporting data that may reflect dwindling resource availability or a lower ranking compared to peer comparisons. Migrating to WMS? This session will provide tips, tricks, techniques and workflows in order to make the library’s resources accessible to users. These tips will allow you to maximize your time, efficiencies, and technology with a new and practical tool box in order to reduce issues and make resources discoverable. Commonly used in software development, Scrum is a simple and practical project management methodology. This presentation will demonstrate how using Scrum to develop a framework for a comprehensive review of e-resource collections kept the project on task, strengthened the project's deliverables, increased team morale, and resulted in equitable task distribution. Librarians regularly support the research that occurs within their organizations, but how are librarians supported as they conduct their own research? This panel discussion will present different ways librarians can become better researchers, from forming learning communities to increasing their abilities to conduct quantitative or qualitative research. I'm a space librarian. I care a lot about the future and legacy of scientific software and the people who make it. Managing astronomy and astrophysics collections for both Harvard and the Smithsonian. MS Data Science + MLIS. Join a scholarly publisher, a discovery service provider, and a university as they uncover, address and provide examples of how collaboration across the groups can have a major impact on the discovery user experience, and ultimately the usage and value of library resources. In addition, the group will discuss issues of concern around search origination as it relates to the statistical information that link resolvers may inadvertently hide, causing publishers and librarians to see only part of the picture of how and where usage occurs. Academic publishers increasingly make their electronic content available through mobile apps. A variety of strategies can be use to promote mobile app availability to drive increased library e-resources usage. This presentation will describe workshop development and delivery experiences, and outline the various strategies used to create increased mobile app awareness. Live-streaming apps like Periscope are rapidly catching on. Learn how you can use these services to engage with your patrons and colleagues in an immediate and authentic way. Presenters will demonstrate how to live-stream events and classes, hold virtual office hours, and give patrons a spontaneous glimpse inside the library. Grab your popcorn at the door and join us for a special sneak peek of the newest collections of SAGE Video and SAGE Research Methods Video. Representatives from SAGE Publishing will be on hand to share our research on how streaming video is being used in higher education. You’ll also have a chance to watch full-length entries from the new subject collections—Business & Management, Politics, Psychology, and Research Methods—at special viewing stations. Apps, local beer, and wine will be served, plus you can strike a pose in our Hollywood-themed photo booth! Join us for morning yoga led by Eastside Yoga! Room 301 has lots of sunlight and a beautiful view of the capital building - what a great way to start your morning! This session is the 6th annual gathering of libraries using, or considering using, the CORAL electronic resources management system. Highlights will include changes to the software, steering committee, governance model and user community. The session will also include an opportunity for attendees to share their local work with CORAL. Scott Vieira is Chair of the CORAL Web Committee and a member of the CORAL Steering Committee. Columbia University Libraries (CUL) explored the costs of e-book frontlists at the time of purchase, as well as through the processes of acquisition, discovery, and access. The findings support best practices regarding resource allocation, staff efficiency, and e-book workflows. Perspectives represent subject specialists, technical services, and collection development. Colleen Major is Head of Electronic Resources Management: Operations & Analysis for Columbia University Libraries, where her work focuses on the electronic resource life cycle. UT Arlington has recently undergone an extensive e-collections review project, with endless cost-per-use calculations. Come learn from our toil as we discuss the metrics behind our methods, including an in-depth dive into loading COUNTER usage statistics into ProQuest’s 360 COUNTER and generating analysis reports in Intota Assessment. S80 - Evaluating the Consortia Purchase: When you can’t get statistics for your own institution, can you extrapolate from other sources? When you share a license with two other institutions, how do you measure use and value? Icahn School of Medicine, NYU Health Sciences Library, and New York University share several important publisher and title packages. By comparing individual title usage we will create a model of shared usage across these institutions. This presentation will outline Michigan State University’s and Swarthmore College’s accessibility efforts for library e-resources. Specific accessibility processes and workflows, purchasing procedures, experiences, and future plans will be shared. Tools utilized to assess web content accessibility and functional usability of licensed electronic resources will also be discussed. We all recognize bad design but what does getting it right require? “Empathy for the people you are designing for and feedback from these users is fundamental to good design,” said Hasso Plattner, Institute of Design at Stanford. Learn key lessons and insights uncovered from students about ebook platform needs. Ebook acquisition, DDA, EBA, Access-to-Own, ebook user experience, ProQuest ebooks. I'm a mom of triplets about to head to university (3 different ones) so in both business & personal life, library resources are important to me! Leading libraries, publishers, and vendors regularly study the practices and needs of academics and students, in order to serve them better. In this session, experienced researchers will examine today’s search behaviors, emerging discovery forms, and access challenges, reviewing strategies for improving discovery and access that result from this research. Comic books, animal rights and UX, of course! The e-resource ecosystem is characterized by constant change in content, systems, standards, practices and technology. Learn how to recognize e-resource burnout and strategize how to avoid emotional exhaustion, reduced achievement, and feeling depersonalized. This session will suggest ways to increase engagement, coping skills, personal efficacy, and job satisfaction. In this age of discovery, users access a staggering amount of journal content, but do they find core journals in their field? Librarians and faculty at a small Midwestern college believe users benefit from highlighting core journal titles. Explore solutions (DIY and licensed) for creating/maintaining custom lists of core journals. Playing back audio and video files isn't enough. These files are full of extremely rich data that archivists can exploit thanks to an emerging category of signal and natural language processing technologies to extract words, emotions, identity, events, and even objects. Some of these are accessible via developer-friendly APIs. Mindful of higher education costs, more schools are encouraging faculty to incorporate Open Educational Resources or Open Access books and articles into courses. Technologies that make open content more easily findable through integrations with Learning Management Systems and other course material distribution tools are making changes in instructor behavior. Click here to view the FREE live video stream! The world of media and learning are steadily evolving and young people are at the center of the transition. In this talk, I explore what researchers have learned about the impact of media technologies in the social and learning lives of children and teens. But even as young people continue to drive change there are many misperceptions about their relationship to technology and learning futures. Today, young people do not just consume media, they "do media." The concept of "doing media" and what it means for designing more relevant learning spaces will be explored. Drawing from ethnographic research and insights generated from more than a decade of studies, I offer some insights on the challenges educators face and the opportunities to reinvent libraries and the learning that happens in them. You need this ticket from Eventbrite to sign up: Post-Conf Workshop 7: EZproxy: Assessment and Administration Techniques and Tips. You need this ticket from Eventbrite to sign up: Post-Conf Workshop 4: E-Resources & Social Media: How to Optimize, Promote, Connect, and Assess. Resources are designed for use by people of all abilities. This workshop will build your proficiency with accessibility for e-resources. Participants will learn strategies to incorporate accessibility measures into workflows, considerations for policy-making and vendor negotiations, and techniques for improving the accessibility of their own websites and online resources. You need this ticket from Eventbrite to sign up: Post-Conf Workshop 6: Create a Course Content Student Affordability Program on Your Campus!. This workshop will give participants an intentional and informed approach to using social media to promote e-resources to library community. Participants will develop a social media plan, learn how to optimize e-resources for social media sharing, connect with community, and assess their efforts. Plans will be tailored for organizational capacity.